Winnipeg's own Cibinel Architecture, formed by George Cibinel recently had one of their incredible works featured on the HGTV site. This project is far too stunning to not help bring some extra attention. "Nestled within a rocky shoreline, The Boathouse is designed for day and night time lounging and entertainment. It is situated at the edge of a densely forested north facing slope with dramatic cliff faces. In addition to needing boat parking and year-round storage, the client wanted a space that captured a full day’s sunlight as well as the northeastern views over the water. 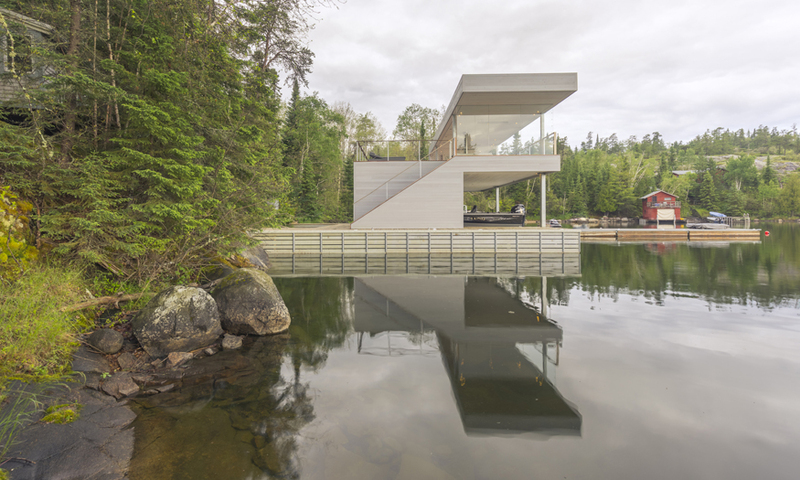 We’re not saying that the lighthouse conversion or the floating patio is passé — but Cibinel Architecture has designed a boathouse in Lake of the Woods in Kenora, Ontario that will make you rethink your lakefront holiday cottage. Cottage owner Lev Zentner worked with Cibinel and The Custom Woodworking Co. to create a recreational space like none you’ve ever seen before. Zentner and Cibinel had two goals in mind for their design. They wanted to create a peaceful, sheltered retreat for Zentner’s family, but it had to also allow for full enjoyment of the abundant sunlight and spectacular views of the lake. The 232-square-metre boathouse nestles into a rocky, forest-topped cliff and looks north and east across the bay. To securely anchor the building over the water, builder Michael Klassen of The Custom Woodworking Co. drilled down into the bedrock — a similar approach to that used for some bridges — sinking reinforced concrete pedestals deep beneath the lake surface onto which the steel-framed structure is bolted. The breathtaking, cantilevered design is surprisingly practical. The main storey provides the actual boathouse, including fitted, covered bays for two speedboats and pier-side mooring for up to eight more craft. The lower floor walls incorporate discreet storage for boating and fishing gear. At 142 square meters, the generous upper floor angles out to the west and north, keeping boats covered and providing a seamless view. 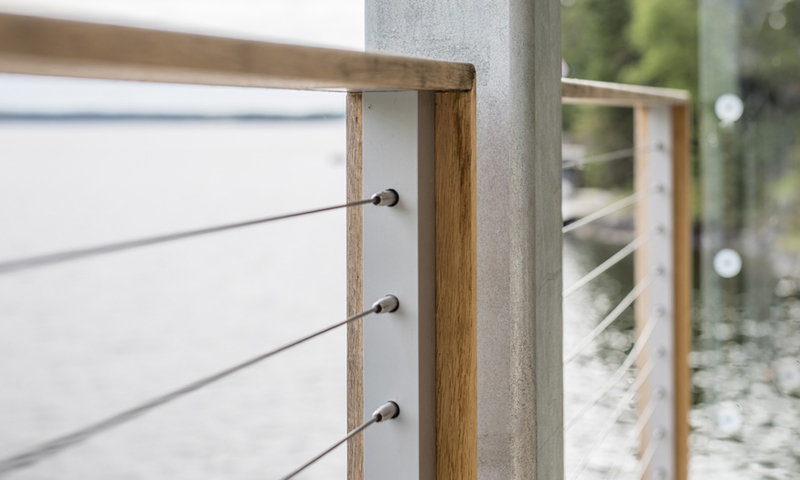 The open-air design minimizes solid walls, replacing them with a panel of half-inch thick tempered glass to buffet winds and a stainless steel cable-strung oak railing by Feeney that visually disappears into the water beyond. The single solid wall hides conveniences that include a fridge, freezer, bar with glassware, snack pantry, and an entertainment system. In addition to a row of lounge chairs, the upper storey boasts Cane-Line sofas gathered around a sleek, modern FireOrb fireplace. A hammock invites serious relaxing. Ceiling-mounted heaters warm the living space, allowing the boathouse to be used over three seasons. A tiled, circular hearth designed to look like flagstone sits level with the Pedra hardwood deck. The sliding mosquito curtain keeps everyone comfortable. Designer touches, like recessed lighting, edge-grain fir wall cladding, and white-stained pine ceilings, make the boathouse feel more like a luxurious living room than a fishing cabin or boat dock. 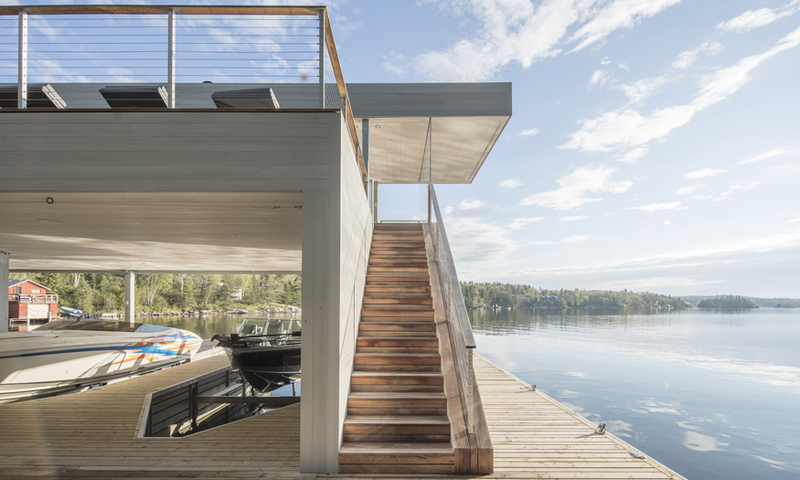 Smooth edges and flush surfaces throughout the structure minimize dirt and insect buildup and make the boathouse easy to clean — because who wants to spend their holiday tidying up? The best part? 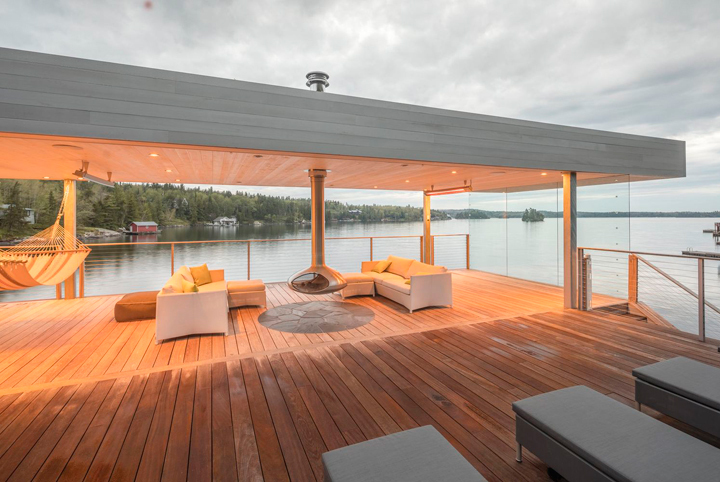 This beautiful boathouse is tempting Zentner and his family to spend more time outdoors enjoying Ontario as it was meant to be enjoyed: lakeside. Its sensible design is so immaculately executed that you shouldn’t surprised to see others popping up in a cottage country near you.